Salina is one of the Y-shaped group of Unesco-protected volcanic islands that rise out of the azure-coloured waters off the north-east coast of Sicily. It is one of the mystical sounding Aeolian Islands, the name conjuring up images of Odysseus and his sojourns in the land of the Sirens, a region so beautiful and alluring that he almost forgot to return home. The Aeolian archipelago consists of eight islands: Salina, an island with a history of salt production, hence the name; Vulcano, nearest to Sicily; Lipari, the largest of these islands with the biggest population of all-year residents; Stromboli, immortalised in the eponymous film with Ingrid Bergman; Panarea, which attracts celebrities in search of seclusion and exclusivity; Filicudi, Alicudi and Basiluzzo. Capofaro, literally ‘head lighthouse’ is Tasca D’Almerita’s super-luxury hotel on the island of Salina Every year in July for the last 6 years or so they have held a Malvasia weekend to celebrate the virtues of the local grape variety. Although Tasca produce their own range of wines on the island, including their own stylish dry Malvasia, they also encourage all the other local producers to get involved. Although at first Tasca might have been viewed with suspicion by the locals as outsiders coming in and stealing their thunder, collaborations like this have helped dramatically to make the other producers realise that Tasca’s efforts benefit them all. 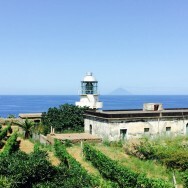 The famous sweet wine from these islands is the Malvasia delle Lipari Passito DOC. Its fame and notoriety goes back to the times of classical antiquity. It must have a final alcohol volume of 18% with 6% residual sugar and the colour ranges from honey when young to amber when aged. 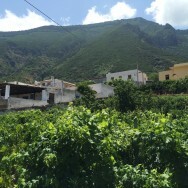 It is made from dried grapes (min 92-95% Malvasia and min 5 % Corinto Nero), but nowadays most producers also make a dry Malvasia as well as a red or rosé. 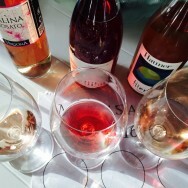 The dry whites are often 100% Malvasia but some are blended with grape varieties such as Carricante, Inzolia and Catarratto to give a little more acidity and freshness, while the reds are either the local Corinto Nero or a blend with local Etna varieties Nerello Mascalese, Nerello Cappuccio or even Nero d’Avola. 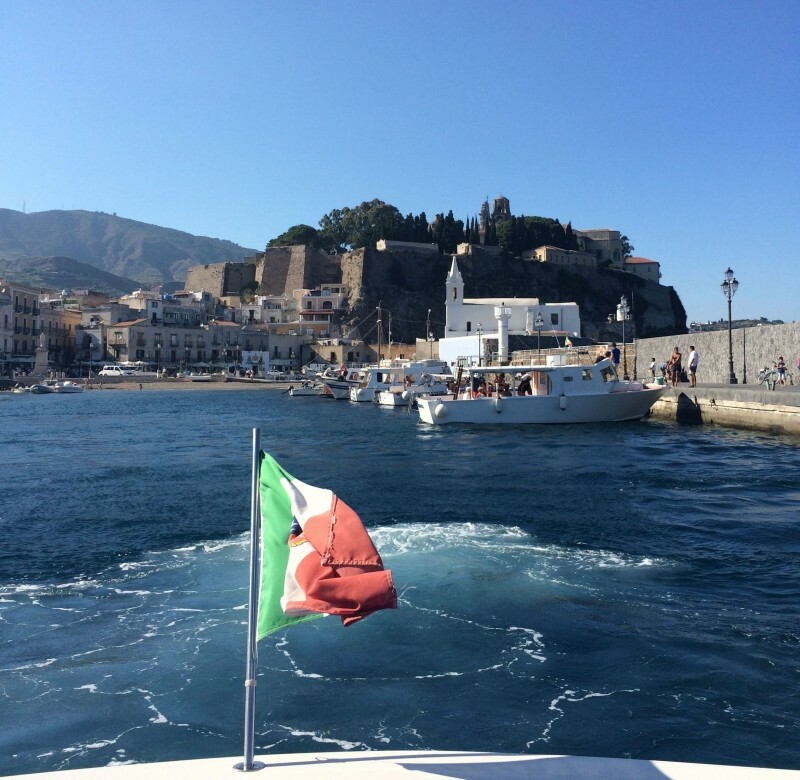 There was more than a touch of glamour at being collected in Tasca’s private yacht and whisked across the sparkling cobalt-blue sea to Vulcano, then Lipari and finally Salina. 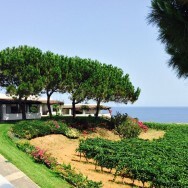 What was especially good about the way this weekend was organised was the altruistic and inclusive approach by the Tasca family to the other producers, the sense of ‘we are in this together’ – such a forward-looking approach is what is needed to promote the generic appeal of these islands and their wine. We visited two producers, Punta Aria and Lantieri, on the austerely beautiful black-sanded island of Vulcano. 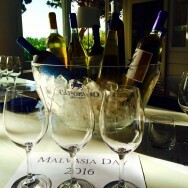 The former make a really delicious and versatile Malvasia delle Lipari with flavours of orange peel and spice and contrasting bitter-sweet notes; served chilled, it would be great with prawns in a chilli jam. The latter make a full and fleshy dry Malvasia, richer than many others. On Lipari we had a quick visit to Tenuta di Castellaro where Massimo Lentsch has made an obviously huge investment in creating a beautiful winery; Salvo Forti, who believes fervently in ‘natural wines’, has been employed to make the wines. Unfortunately I found several of their wines a bit too funky/faulty to be enjoyable but there was an attractive red wine made from Corinth Nero . It is a real pity that several of the wines were so flawed and hard to enjoy as they were a lovely team of people and I am keen to see them do well. After a brief swim in the sea near Lipari’s disused pumice factory with its white pumice beaches we headed to the lusher and greener vegetation of Salina and our luxurious stay at Capofaro. The setting for Capofaro is stunning. The low rise, white-washed rooms and suites are decorated in a style reminiscent of the Greek Cyclades and look out across the Tasca vines and the ‘wine dark’ sea to the islands, with the eponymous lighthouse punctuating the scene. Everything is cool, elegant, minimalist and white both inside and out of the en-suite rooms. 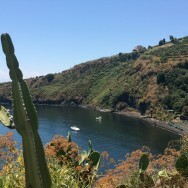 But it is the views from the terraces and verandas that captivate the most; the foreground of Tasca’s bright green Malvasia vines, intermingled with lively spurts of vibrant magenta bougainvillea, soft-green olive trees and the occasional lemon tree, merges into the sparkling deep blue sea on the horizon with the islands of Stromboli and Panerea glittering in the distance. At night, except for the rhythmic beam of the lighthouse, the lighting outside is deliberately kept to a minimum so that you can really appreciate the amazing star-filled skies. There is a feeling of relaxed elegance but at 500 euros a night in high season perhaps this is nothing less than you would expect. We had barely had time to settle in our rooms before a quick change and it was time for dinner and a self-serve tasting with all of the major Malvasia producers on Salina. Tasca, Hauner, Fenech, Caravaglio, Marchetta, Colosi, Virgona, D’Amica and Florio (who source their grapes on Salina) were all either present at the dinner or had sent their wines. Of course there was a huge variety of styles. Next day our little group of mainly Italian journalists were split into two groups and visited 2-3 of the producers on Salina individually. I visited D’Amica, the smallest of the producers, who cultivate organically and also employ Salvo Forti as their consultant winemaker. Most of their wines were a little too funky with some unattractive, sulphide aromas. Next we visited Fenech with an amazing sea view and a smart new stainless steel cellar. His dry Malvasia was richer and had a more unctuous texture – his wines were round and appealing. Next onto Virgona where there was a long discussion about the fate of the caper and how to protect the Salina provenance for this all important crop that Salina is world famous for. We also tasted a beer made from Malvasia, their exciting new project. It was very good, with a full-flavoured, hoppy style. Finally we called into Gaetano Marchetta, a big, bluff, generous man who insisted on giving us jars of capers and sundried tomatoes and where we tasted a very old Malvasia delle Lipari from 1972 which was still holding its own. That evening I did my own seated tasting of all of the producers who had shown their wines but even within this fairly small group there were some very divergent styles. Several of the dry Malvasias stood out for me as especially good: Tasca’s Tenuta Capofaro ‘Didyme’ 2015 Malvasia IGT Salina was a delicious dry and fresh Malvasia, much paler in colour than most, in a crisper style with light green herbal/olive notes and pithy, pink grapefruit flavours, almost reminiscent of some elements of Sauvignon Blanc. Meanwhile Fenech’s dry Malvasia Maddalena 2015 100% Malvasia was much more golden coloured, with a rich, full bodied style and waxy, lemon oil notes. My favourite of the dry whites was Carlo Hauner’s ‘Iancura’ 13% 2015 IGP Terre Siciliane, 20% Ansonica/Inzolia 80% Malvasia. 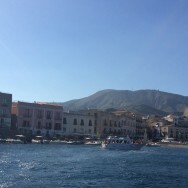 The name ‘Iancura’ is an Aeolian island dialect word meaning “whiteness” and refers to the state where the calm sea merges with the white-blue sky and represents a mood of grace, calm, and joy. This was a pale, very limpid wine with light honey, acacia and cream notes on the nose, a full textured wine with waxy lemon peel, orange peel and spice notes intermingled with a savoury finish. Very clear, pure and precise. Hauner also make ‘Hiera’, a very attractive red with a stunning label; the name means ‘sacred’ and is taken from the ancient name for Vulcano. 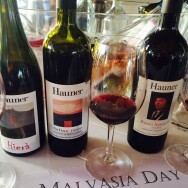 The 2014 (13.5%) was made from Calabrese (Nero d’Avola), Alicante (Grenache) and Nocera. This medium-bodied wine had delightfully contrasting flavours of sweet red fruits followed by tart redcurrant with smoke and spice notes and a pleasing freshness on the finish. Caravaglio’s Malvasia Bianco Secco IGP Salina 2015 had an attractive blend of orange peel, a hint of honey and flower notes followed by pithy, green olive flavours and a salty, savoury finish. I also liked Marchetta’s ‘Bianco Del Comandate’ Malvasia 2015 which, like the man himself, was generous and bursting with the richness of local flavours of lemon, orange peel, delicate flowers and wild herbs and of course the sea-salt fingerprint of many of these volcanic whites from Salina. The haunting beauty of the islands, the distinctive local wines and produce left me wanting to return and linger a while and discover more. With special thanks to my generous hosts the Tasca family, Grassi partners and the local producers. © 2016, Susan Hulme MW. All rights reserved. Valpolicella is a wine region we all think we know. Many of us may have cut our teeth on this light, fruity red when we first began to drink wine, but, like in many great wine regions, nothing stands still. I discovered there is always something more to learn on my first trip of 2016 when I attended the 13th edition of Anteprima Amarone. This is the big showcase event where the newly-released Valpolicella Amarone wines are first shown to the press at the end of January; it is held in the beautiful city of Verona in the Veneto.